Falling-off the bone tender and tasty Chinese Barbecue Ribs (Char Siu) made in the crock pot and finished by broiling in the oven. Hands down THE BEST ribs ever! Crazy for ribs? Well you are not alone! Pork ribs are a family affair at my household. 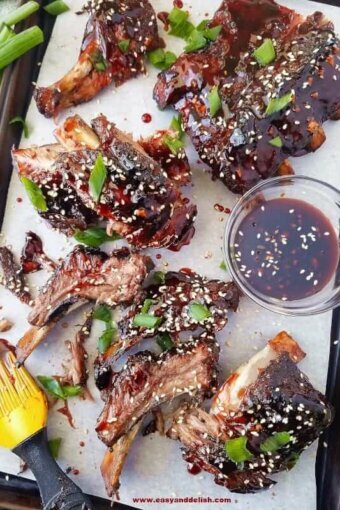 I have made several types, but nothing like these Asian ribs, Char Siu inspired. 😉 I pinky swear!!! Our Barbecue Pork Ribs is an adaptation of that traditional Chinese recipe. Most of the cooking happens in the crock pot, resulting in super-tender ribs. Then, our char siu pork ribs are broiled in the oven, giving them a mouthwatering look. 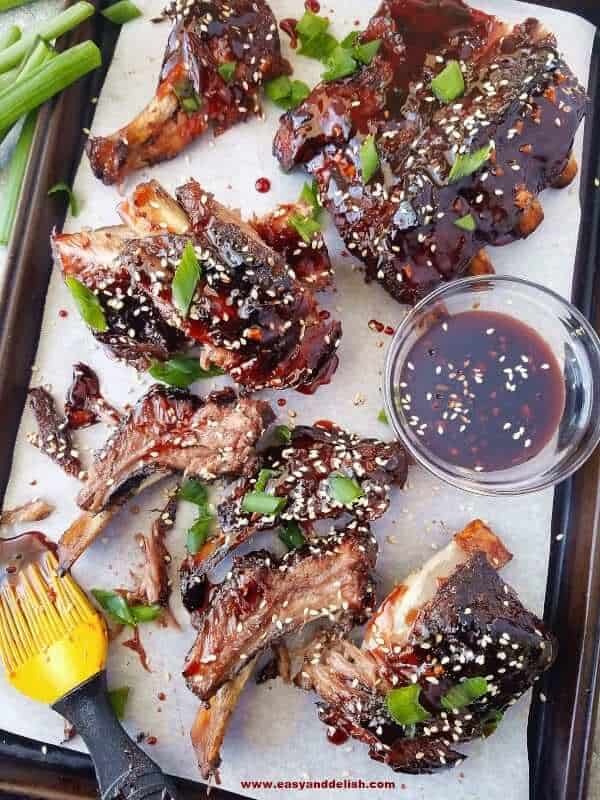 Some of the ingredients– such as honey, five-spice, soy sauce, red food coloring, and rice vinegar– make these ribs unique. As a result, needless to say, these baby back ribs didn’t last long. Although I served them with white rice, you can also enjoy them with noodles or other side of choice. My favorite way to eat them is sandwiched in Texas toast bread and dipped in their own broth (French dip style). First, remove the membrane from the ribs and discard; reserve ribs. In a medium bowl, combine brown sugar, five-spice powder, garlic powder, chili powder, salt and pepper. Spread dry rub mixture on both side of the ribs and then place them in the slow cooker. You may have to curl the rack of ribs along the inner wall of the crock pot in order to fit it in. Next, prepare the sticky sauce. Mix together brown sugar, honey, soy sauce, rice vinegar, sriracha, minced garlic, and red food coloring in a small saucepan. Pour half of the sauce in the crock pot, cover and cook for 4 hours on high or 6-8 hours on low until tender. Transfer ribs to a large baking sheet lined with parchment paper and brush with sauce. Broil for about 7-8 minutes. Meanwhile, whisk cornstarch with water in a small bowl; reserve. Bring remaining pan sauce to a boil, reduce heat to medium, and then whisk in cornstarch mixture. Make sure to stir sauce constantly until thickened, about 5-7 minutes. Remove ribs from oven and brush them with thickened sauce. Garnish top with sesame seeds and green onions. Serve with rice, noodles, or in a sandwich. Use the crock pot broth to dip your rib sandwich into (french dip style). 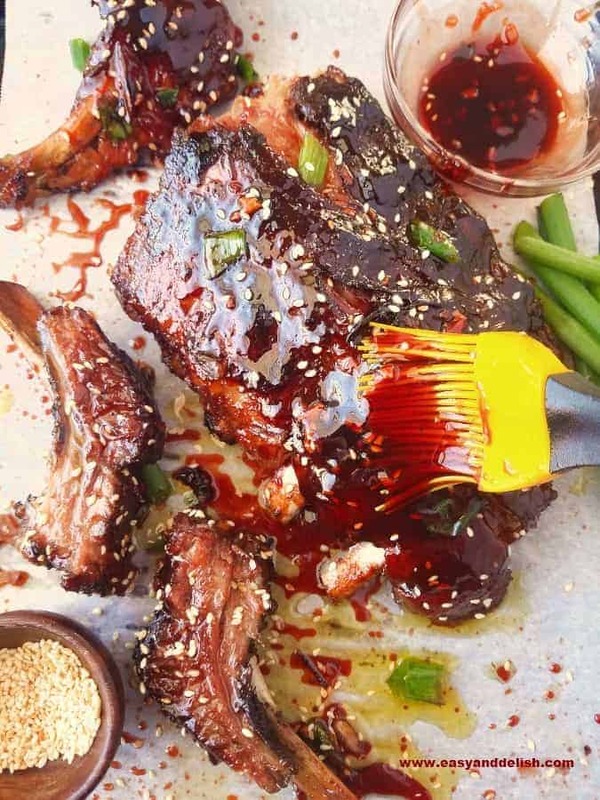 Can’t get enough of barbecued ribs? Also try our Red Wine Barbecue Pork Ribs. Store leftovers covered in the fridge for up to 4 days, or freeze them in small portions (sealed bags) for up to 4 months. Shred ribs and use in sandwiches, pizzas, and fried rice. If you are celiac, make sure to use a gluten-free soy sauce. Moreover, if you don’t like artificial colors, skip the food coloring. Falling-off the bone tender and tasty Chinese Barbecue Ribs made in the crock pot and finished by broiling in the oven. Hands down THE BEST ribs ever! Remove membrane from the ribs and discard; reserve ribs. In a medium bowl, combine brown sugar, five-spice powder, garlic powder, chili powder, salt and pepper. 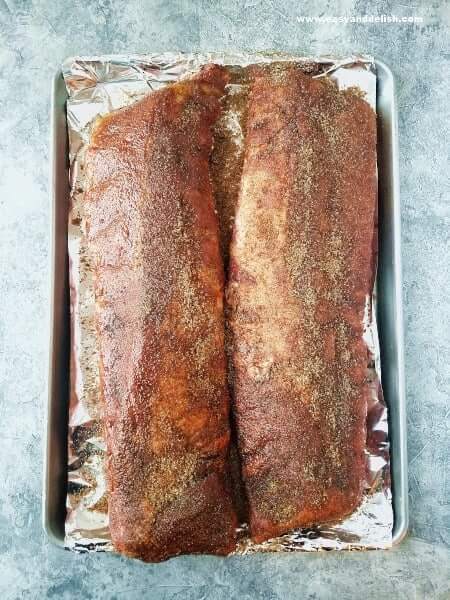 Spread dry rub mixture on both side of the ribs and then place them in the slow cooker. 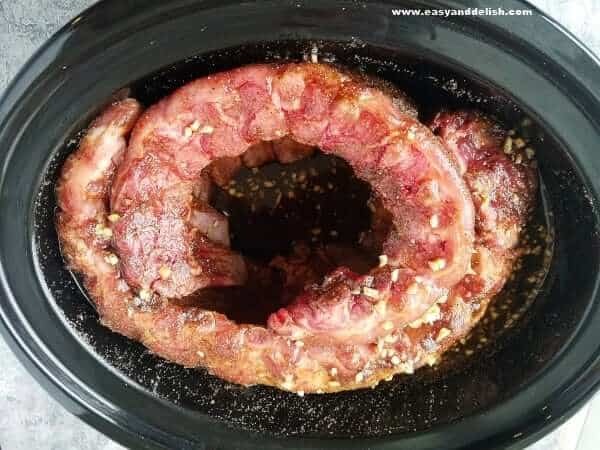 You may have to curl the rack of ribs along the inner wall of the crock pot to fit it in. Prepare the sticky sauce. Mix together brown sugar, honey, soy sauce, rice vinegar, sriracha, minced garlic, five-spice, and red food coloring in a small saucepan. Pour half of the sauce in the crock pot, cover and cook for 4 hours on high or 6-8 hours on low until tender. Transfer ribs to a large baking sheet lined with parchment paper and brush with sauce. Broil for about 7-8 minutes. Meanwhile, whisk cornstarch with water in a small bowl; reserve. Bring remaining pan sauce to a boil, reduce heat to medium, and then whisk in cornstarch mixture. Make sure to stir sauce constantly until thickened, about 5-7 minutes. Remove ribs from oven and brush them with thickened sauce. Garnish top with sesame seeds and green onions. Serve with rice, noodles, or in a sandwich. Use the crock pot broth to dip rib sandwich into (french dip style). Love barbecued ribs? Try our Red Wine Barbecue Pork Ribs. Store leftovers covered in the fridge for up to 4 days, or freeze them in small portions (sealed bags) for up to 4 months. Shred ribs and use in sandwiches, pizzas, and fried rice. If you are celiac, make sure to use a gluten-free soy sauce. 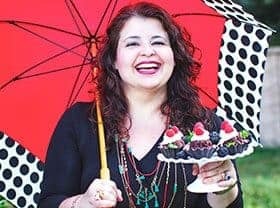 If you don't like artificial colors, skip the food coloring. I almost never prepare ribs in the crockpot — need to that more often. Such an easy way to prepare them! Terrific recipe — thanks. Oh yum. I love all of the ingredients in your ribs! And they look super fabulous. By the way, we went to Rio and to Iguacu Falls in Brazil. What a beautiful country! Hi, Mimi! Thank you! I am so glad you enjoyed your staying in Brazil. We will be visiting my sister in Rio in the summer. What a delicious way to prepare ribs. Finishing off the ribs under the broiler, makes this crock pot recipe week night friendly, fabulous. Love the look of your ribs…I’ll just have to do them in the oven.